TS PGECET 2017 Result released. Candidates who gave their exam can download Postgraduate Common Entrance Test results from the official website pgecet.tsche.ac.in Osmania University has conducted the exam from 29th May 2017 to 1st June 2017. Candidates who cleared TS PGECET will get admission in courses like M.Tech./ME/M.Arch. A part from the official website the Telangana PGECET Results are declared at Manabadi, schools9 websites. Check the official website pgecet.tsche.ac.in to download your TS PGECET Rank Card 2017. Some students may face difficulty while checking their results. We have provided some simple steps to download your TS PGECET 2017 Result at the bottom of our page. Osmania University on behalf of Telangana State Council of Higher Education (TSCHE) is responsible for conducting various Undergraduate and Postgraduate Entrance Tests in the state of Telangana. 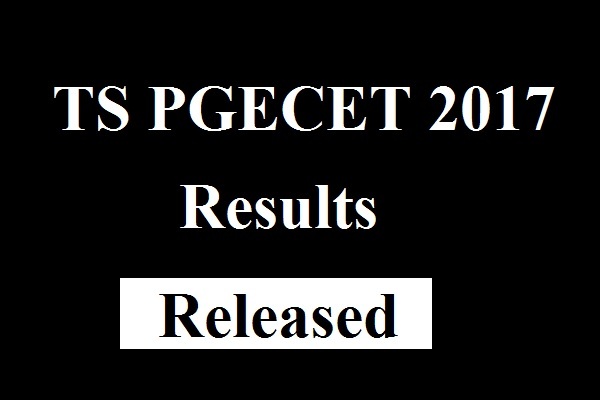 Now it has released Telangana PGECET Results on its official website pgecet.tsche.ac.in. Candidates will be intimated to attend the counselling on particular dates based on his rank. Download Telangana PGECET Rank Card from the official site. Registration Number and DOB is mandatory to check your results. Candidates will be allotted ranks based on his overall performance in the exam and cut off marks. OU has released the TS PGECET Cut off Marks on its official website pgecet.tsche.ac.in. Minimum 30 Marks is the qualifying mark for OC category students. TS PG Common Entrance Test Counselling starts from the month of August. Follow our website www.Techfactslive.com on Facebook & Twitter to get all the latest updates regarding Telangana State PGECET Counselling Dates and Seat Allotment Procedure. If you have any Problem Contact us at [email protected].